4-year dating This IKAROS red parachute rocket is designed for commercial (MCA) or leisure use. Introduced in 1959, the same design is now used by most manufacturers around the world. The IKAROS original is the leading parachute rocket with quality and performance that meets the highest demands on function and safe operation. The launching tube has clear instructions and a non-slip surface to ensure safe operation even when launched with one hand. 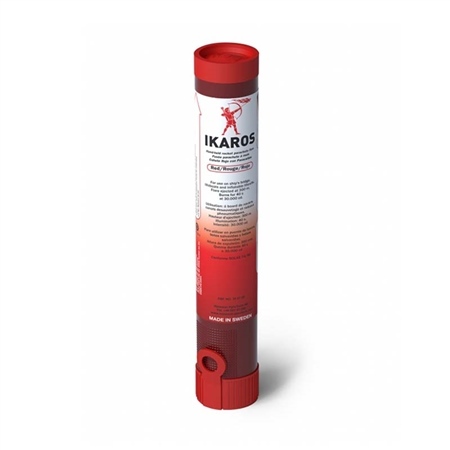 The IKAROS parachute rocket is approved globally and meets the latest SOLAS 74/96 regulations. I was on a 2 day fishing excursion in the Pacific and the boat was hit by a tree log or something and the pumps couldn't handle the rate of water coming in and the light had faded. We had to go to a life raft but lucky we were only 2 or 3 kilometres from a shipping lane and we used 2 of these and we were rescued. I now own my own boat and apart from my EPERB I have supplemened this with both hand flares and rocket flares. When it comes to safety money should be an obstacle other wise you shouldn't be out there in the first place. I highly recommend you purchase a handful of these as they can be seen far further than a stationary hand flare. The only draw back is a hand flare can last longer.